I’ve been in such a burger mood recently, possibly since we came up with our new bread recipe it makes a very good burger roll, these burgers have a good zingy flavour with the fresh herbs and lime juice, the sweetness of the sweet potato, the earthiness of the black beans .. It gives a really good combination of flavours that blends really well together. 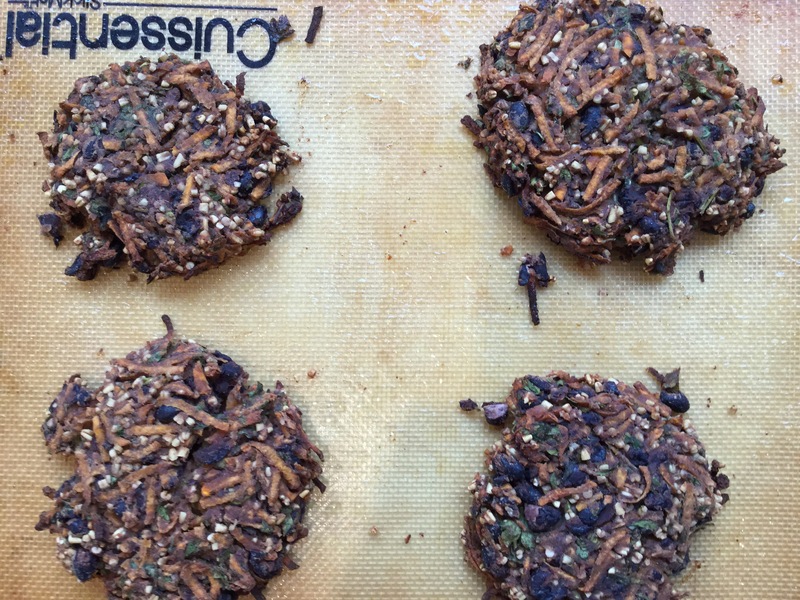 I’m using pinhead oatmeal and pea protein to bind the burgers together, if you don’t have them don’t worry at all, use an alternative like tapioca flour, potato flour pretty much any flour will help bind the mixture but start with a smaller amount first though as they will all bind differently. I tried cooking these in a pan and the oven, both works well, but I think the oven works a bit better (and uses less oil) as the burgers need to cook through and are moist enough not to dry out. Pre-heat the oven to 180 centigrade fan. 1 400g tin of black beans, drained. 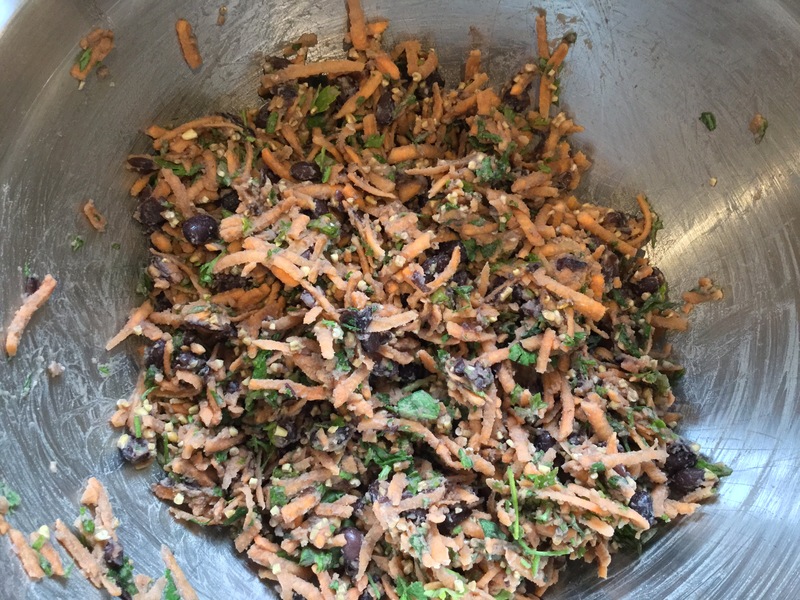 Add the grated carrot and black beans to a large bowl and roughly squash with a fork, this is just to break the beans up a bit, which will help bind our mixture. Add the herbs, lime juice and salt and mix gently. Add the oats and pea protein and mix together with your hands, it’s messy I know but it helps judge how much hot water is required to help the mixture hold together. Add enough hot water to hold the mixture together, I used about 30ml. Form into 6 patties and place on an oiled baking tray, pop in the oven for about half an hour. They freeze well too. interesting recipe- might have to try! oh wow! why have I never thought of putting sweet potato in my burgers! genius! haha! i bet it was awesome! They were rather tasty, I was really pleased!